Two main reasons influence your choice of toolbox; You want to protect the contents and you need the box to fit a particular location. In Australia, the mobile location most needing a secure box is the ute. At Ute Safe, our name ensures we focus on these twin goals, a secure box where you need it most. You may need to store tools, parts, guns, chains, music gear, communication, camping fridges, retrieval equipment, shopping, etc. You may wish to locate the box above or below a tray in or on a rack, in the boot, in the van, on a trailer, under a carport, or in the office. 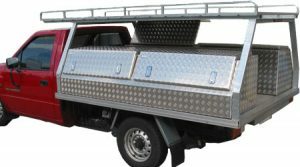 No matter what your box is for or where it goes the Ute Safe solution is a quality designed and styled box. Our high standard is extended to every box and we select the same material and use the same work process for every custom or standard toolbox. Our standard range has been created from the most popular custom boxes we have made and we try to hold this extensive range in stock to quickly supply a solution to your requirements. As stocks run low we have a 2-5 day replacement strategy. We first began making custom boxes and these still comprise a significant portion of our production. Custom boxes require the most time to make and may take 2-4 weeks. We also offer our back catalogue of proven custom made designs on a made to order basis. These are faster to produce than a brand new design from scratch. Every box is computer designed, cut and folded, we can reproduce any design or component (such as the door) of a unique custom box and know that it will fit. This is great reassurance in the event of an accident and allows us to readily repair any box brought back to the factory. Demand for our standard range has increased and our factory located in Campbellfield, Melbourne allows us to hold stock of these commonly asked for boxes. Growth without compromising quality of service is our continuing goal.